There was probably a Saxon church on this site as Saxon Lords took time erecting churches on their lands and remains were found during the 19th century restoration. A late Saxon stone fragment with an interlaced design is built into the east wall of the chancel and we know that Terrington was in existence at this time as it is recorded that in “970 Godric gave his lands in Turringtonea to the Abbey at Ramsay” Three concentrations of late Saxon pottery shards were found north of the church during field walking. Dr Seccombe a local doctor, wrote in 1892 of the evidence of a Norman church when underpinning of the west wall and rebuilding of the south west turret of the present church was carried out in 1887. Remains of the bases of the Norman columns of the west door are visible today. The Norman church gave way to an early English building, remains of which can be found in the chancel, the doorway opening into the vestry and the window east of it on the north wall. The double-drain piscine dates from 1272-1307 and the three seat sedilia used by the celebrant, deacon and sub- deacon are of this build and, at the base of the nave pillar near the south side of the crossing can be seen the base of the earlier building. The present building known sometimes as “the Cathedral of Marshland” is reputed to be one of the finest Perpendicular churches in England. It has a fine clerestory and grand west end with a five-light window, built on the Norman and Early English foundations in the 14th and early 15th centuries of Barnack stone transported by water from Northamptonshire. Stone from the previous building was also re-used. Why has Terrington got such a magnificent church? In the boom years of the first half of the 14th century, before the Black Death of 1349 and into the early years of the Hundred Years War, raw wool exports to the continent increased and this area provided excellent grazing on marshland and summer lands in the Fens. The village was rated second to Walpole in the Norwich Taxation of 1254, but it rendered the highest return for the Marshland villages in the levy of 1291 and in the Lay Subsidy of 1334. At the time of building the church was in the diocese of Norwich and in 1342 Edmund de Gonville, founder of Gonville college, Cambridge was appointed Rector. He was also Commissioner of Marshland and seems to have had a close connection with Bishop William Bateman of Norwich. The church has a massive bell tower containing eight bells which stands a few feet way from the northwest corner of the church. It is believed that there were plans to build a central lantern at the crossing similar to the one at Ely Cathedral but it is considered that it may have been too much to support at that position and was never proceeded with. The transepts were to have been longer as can be seen from the unfinished work on the outside. The Black Death was certainly the reason for the much reduced size of the building. Statues of St.Clement and St. Christopher were found during restoration carried out in 1887 hidden behind the redundant buttresses on the west wall. There are two family vaults within the church one under the Altar, the other at the rear of the organ. The one beneath the Altar contains the bodies of members of the Bentinck family. Amongst them are Admiral William Bentinck, John Albert Bentinck and William Pierrepont Bentinck. All were very much involved in the re-routing of the river Great Ouse and reclamation of many acres of land from the sea. The other vault contains the remains of Sir Andrew Snape Hamond and his wife. Sir Andrew Snape Hamond Bart. FRS was a man of some standing, not only locally but also nationally. He was a brother of Trinity House, his father was a respected shipping owner and merchant in London and his uncle Dr Andrew Snape was provost of King’s College, Cambridge. During the American war he was officer commanding the Roebuck which featured quite prominently at that time. He was knighted in 1778 and not long after he was appointed Governor of Nova Scotia and Commissioner for the Navy at Halifax. He was Commander of the river Medway, becoming Comptroller of the Navy in 1794. He was also M.P. for Ipswich on two occasions. He re-built Terrington Court (formerly Hamond Lodge) in 1810 and laid out a hansom park around the building. The font is of 14th century style and the cover which opens out to show scenes believed to be Flemish work depicting the Baptism and Temptation of Jesus. In the transepts are two painted boards dated 1635 of the creed and the Lords Prayer There are many shields on the battlements depicting the arms of local families and one of the Bishop at the time the building was being built. 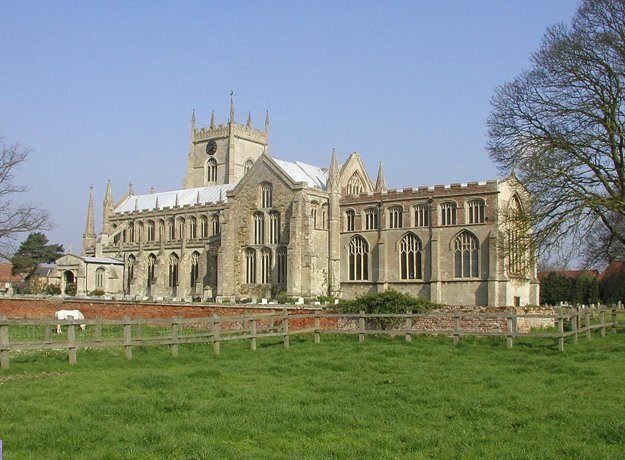 The church registers date back to 1598 and are kept at the Wisbech & Fenland museum. A more detailed account has been compiled in the book “Terrington St.Clement-An Historical Account” .